Home of the NMCA Muscle Car Nationals drag racing series and the "World's Fastest Street Cars", ProMedia Events is pleased to announce the 2016 schedule for the Chevrolet Performance Challenge Series. This all-GM series features purpose-built race cars and street legal cars equipped with Chevrolet LS and modern LT powerplants such as 5th Gen Camaros, C5 Corvettes, Z28 Camaros, late-model Firebirds and GTOs. With 2016 marking the 10th Anniversary of the original LSX Shootout, the four events on schedule for the Chevrolet Performance Challenge Series are the place to be for all racers and enthusiasts of late-model GM-equipped vehicles. "We are thrilled to bring another year of exciting, side-by-side all-GM drag racing to our fans and racers," said Rollie Miller, ProMedia National Event Director. "This series includes some of the best engineered LSX-powered race cars in the country. They're events that Chevrolet fans don't want to miss." 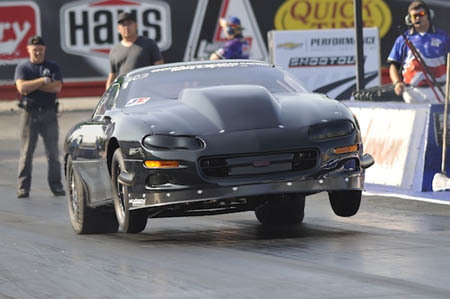 Since the Chevrolet Performance Challenge Series takes place during the NMCA Muscle Car Nationals in Indiana and Ohio, spectators will be treated to the absolute best in all-American muscle car drag racing. NMCA events include 250+ mph Pro Mods, Street Outlaws, giant all-domestic car shows on both Saturday and Sunday, huge manufacturers' midways, swap meets, burnout contests and more! For more information on the Chevrolet Performance Challenge Series click here.